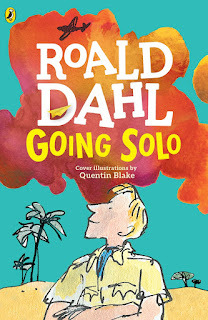 Excerpt: Going Solo by Roald Dahl for the Roald Dahl 100 Celebration! I couldn't pass up an opportunity to participate in this fun blog tour celebrating what would have been Roald Dahl's 100th birthday. I am glad to share an excerpt from this book Going Solo, today. Going Solo is the action-packed tale of Roald Dahl's exploits as a World War II pilot. Learn all about his encounters with the enemy, his worldwide travels, the life-threatening injuries he sustained in a plane accident, and the rest of his sometimes bizarre, often unnerving, and always colorful adventures. Told with the same irresistible appeal that has made Roald Dahl one of the world's best-loved writers, Going Solo brings you directly into the action and into the mind of this fascinating man. A life is made up of a great number of small incidents and a small number of great ones. An autobiography must therefore, unless it is to become tedious, be extremely selective, discarding all the inconsequential incidents in one’s life and concentrating upon those that have remained vivid in the memory. The first part of this book takes up my own personal story precisely where my earlier autobiography, which was called Boy, left off. I am away to East Africa onmy first job, but because any job, even if it is in Africa, is not continuously enthralling, I have tried to be as selective as possible and have written only aboutthose moments that I consider memorable. In the second part of the book, which deals with the time I went flying with the RAF in the Second World War, there was no need to select or discard because every moment was, to me at any rate, totally enthralling. The ship that was carrying me away from England to Africa in the autumn of 1938 was called the SS Mantola. She was an old paint-peeling tub of 9,000 tons with a single tall funnel and a vibrating engine that rattled the tea-cups in their saucers on the dining-room table. The voyage from the Port of London to Mombasa would take two weeks and on the way we were going to call in at Marseilles, Malta, Port Said, Suez, Port Sudan, and Aden. Nowadays you can fly to Mombasa in a few hours and you stop nowhere and nothing is fabulous anymore, but in 1938 a journey like that was full of stepping-stones and East Africa was a long way from home, especially if your contract with the Shell Company said that you were to stay out there for three years at a stretch. I was twenty-two when I left. I would be twenty-five before I saw my family again. What I still remember so clearly about that voyage is the extraordinary behaviour of my fellow passengers. I had never before encountered that peculiar Empire-building breed of Englishman who spends his whole life working in distant corners of British territory. Please do not forget that in the 1930s the British Empire was still very much the British Empire, and the men and women who kept it going were a race of people that most of you have never encountered and now you never will. I consider myself very lucky to have caught a glimpse of this rare species while it still roamed the forests and foothills of the earth, for today it is totally extinct. More English than the English, more Scottish than the Scots, they were the craziest bunch of humans I shall ever meet. For one thing, they spoke a language of their own. If they worked in East Africa, their sentences were sprinkled with Swahili words, and if they lived in India then all manner of dialects were intermingled. As well as this, there was a whole vocabulary of much-used words that seemed to be universal among all these people. An evening drink, for example, was a chota peg. One’s wife was a memsahib. To have a look at something was to have a shufti. And from that one, interestingly enough, RAF/Middle East slang for a reconnaissance plane in the last war was a shufti kite. Something of poor quality was shenzi. Supper was tiffin and so on and so forth. The Empire-builder’s jargon would have filled a dictionary. All in all, it was rather wonderful for me, a conventional lad from the suburbs, to be thrust suddenly into the middle of this pack of sinewy sunburnt gophers and their bright bony little wives, and what I liked best of all about them was their eccentricities. It would seem that when the British live for years in a foul and sweaty climate among foreign people they maintain their sanity by allowing themselves to go slightly dotty. They cultivate bizarre habits that would never be tolerated back home, whereas in far-away Africa or in Ceylon or in India or in the Federated Malay States they could do as they liked. On the SS Mantola just about everybody has his or her own maggot in the brain, and for me it was like watching a kind of non-stop pantomime throughout the entire voyage. Let me tell you about two or three of these comedians. In celebration, Puffin released 15 newly redesigned paperback covers of Roald Dahl books. You can enter the following giveaway to win all 15 books and a special tote bag!